Quarterback Bryson Bolin (right) and running back Josh Bornes are part of a high-scoring San Marcos offense. 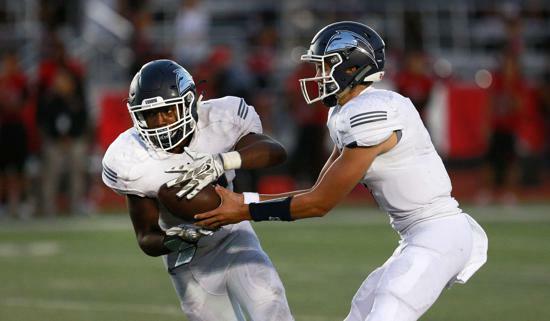 SAN MARCOS  Nobody has been able to challenge the San Marcos High football team through its first three games of the season. That figures to change starting next week. The Knights produced a third straight blowout victory Friday night, building a 41-point lead by the half before breezing to a 47-14 win over visiting Del Norte in a nonleague game. San Marcos (3-0) has wins by 24, 17 and 33 points, but its next seven games should be much closer with Oceanside, El Camino, Torrey Pines, Carlsbad, La Costa Canyon, Mt. Carmel and Mission Hills on the slate. Tyler Rogers showed he is ready for the challenge, as the Knights’ running back had a pair of touchdown runs and a 12-yard reception for a score in the first half. He finished with seven carries for 53 yards before giving way to the reserves in the second half. San Marcos quarterback Bryson Bolin, who threw for over 350 yards in each of his first two games, was sharp again. The senior finished with 208 yards and three touchdowns passing. Along with Rogers, he connected with Drew Morgan and Kyle Philips for scores. Philips had five catches for 88 yards. Tylee Hodson quickly gave the Knights a 6-0 lead when he returned the opening kickoff 95 yards for a score. Just over two minutes later, after the Nighthawks (2-1) fumbled the ball away, Bolin hit Morgan for a 5-yard touchdown to make it 12-0. Rogers closed the first quarter with a 39-yard touchdown run to give the Knights a commanding 20-0 lead. San Marcos added 21 points in the second quarter, capped by a 40-yard interception return for a touchdown by Ethan Cline.